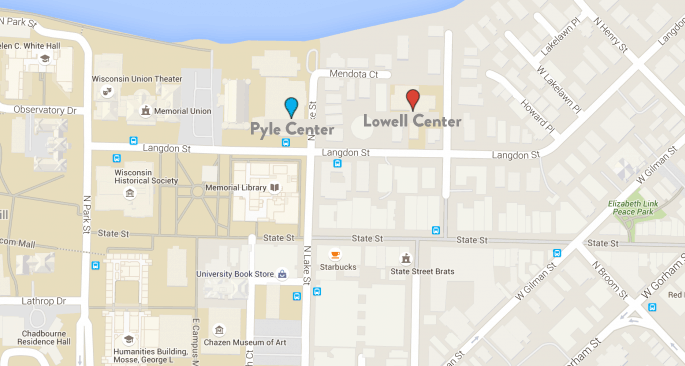 Pyle and Lowell Centers are located in downtown Madison, in the heart of the UW-Madison Campus, alongside Lake Mendota. We are situated within walking distance of the Capitol square, right by State Street, and a 15 minute drive from the Dane County Regional Airport. The main entrance for drop off, pick up, and parking is on Frances Street. Exit Hwy 12/18 at Park Street (Exit 261 B). Proceed north on Park Street about 3 miles to Langdon Street. 702 Langdon Street is on the corner of Langdon and Lake Street. Head north on International Lane. Gorham Street becomes University Avenue. Turn right off of University Avenue onto North Lake Street. 610 Langdon is one and a half blocks eastward down Langdon Street, at the corner of Langdon and Frances Street. Our main entrance for drop off, pick up, and parking is on Frances Street. Turn right off of North Lake Street onto Langdon Street. Lowell Center is at the corner of Langdon and Frances Street. Call 608-256-2621 to book a room in our hotel. If you’d like to learn more about our facilities or plan your event, call us at 608-262-0881.